Go to the RealVNC Web page. The Web site contains information about virtual network computing (VNC). Download the viewer for your laptop and both the viewer and server for your desktop. The viewer doesn’t require any installation; you simply run the program. The server requires a bit of installation, but it’s cinchy to follow the instructions on the screen. To set things up on the server, right-click the VNC icon in the notification area. This displays the VNC Server Properties (Service-Mode) dialog box. On the Authentication tab, select the VNC 3.3 Authentication, No Encryption option. Click the Set Password button to choose a system password. If you know the IP address from which you’ll connect to the desktop, enter it on the Connections tab. 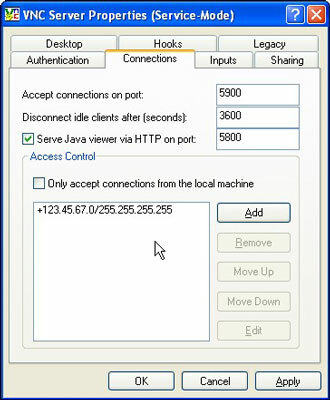 In the above example, only IP address 123.45.67.0 can access this computer remotely. In the Access Control area, click the Add button, and then enter the IP address. Click OK to close the dialog box when you’re done. To make the connection, run the viewer program on your laptop. 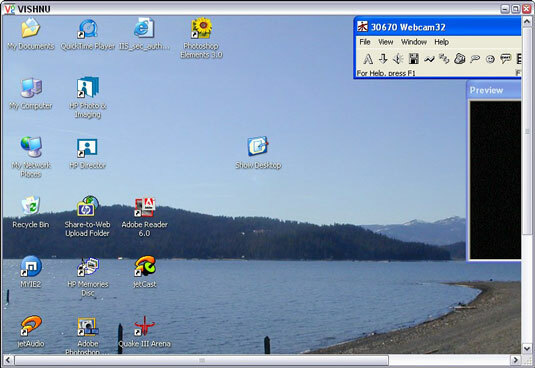 In the dialog box that appears, enter the network name or IP address of your desktop computer, and then click OK.
Another computer’s desktop appears in your laptop’s window. When you move the mouse on the laptop, the mouse moves on the desktop. Open a window. Run a program. What you see on the laptop is happening over the network on the desktop. When you’re done, just close the other computer’s window on your laptop.